We are excited to offer the Newport Cooks Kitchen for sub-lease to like minded food production and food related businesses. 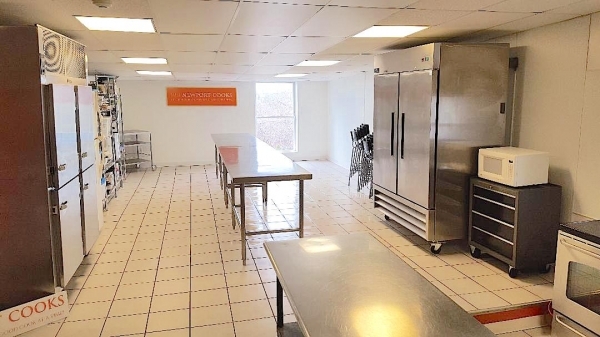 As subletters we are all roommates of sorts and must be mindful that this wonderful kitchen allows us all to operate our small businesses at a fraction of the cost of owning individual kitchens. We are looking for sub-letters who will keep the kitchen clean, neat and always in "inspection" condition. You must sign a sub-lease agreement and indicate whether your business is Seasonal or Year Round. Monthly rent is due on the 1st of every month based on the number of hours you have booked on the shared calendar. If you need to add Kitchen time mid-month, it is pay as you go. The monthly minimum usage is 8 hours per week. The Kitchen may only be used when you, the business owner, are present. Kitchen time is reserved on a monthly “Use it, or Lose it” basis and can not be carried over into the next month or substituted for another day, even if that day is open on the calendar. You’ve booked the time, making it unavailable for anyone else to book, it’s yours. You get 2 shelves in the Kitchen for equipment storage in your rental fee. If you need refrigeration there is space available in the large refrigerator. If you need more storage space, please ask about leasing space on the 3rd floor. Retail opportunities are available downstairs too! This is additional. Always leave the kitchen as you found it. Clean all surfaces, sanitize work benches, clean oven and stove top, sweep floors and mop using a floor cleaner. 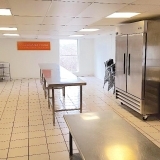 The Kitchen always needs to be in “Show Condition” for cooking classes, the Health Department and for client meetings. Please also sweep the stairs and anywhere else you have walked and/or worked. We stock the Kitchen with supplies collectively (paper towels, cleaners, toilet paper, tissues, sponges, dish liquid etc.) Please add on a regular basis and share with everyone else. If you prefer not to share, please bring your own and please don’t use anything collectively brought into the kitchen. If, for whatever reason, you no longer wish to sub-let at the Newport Cooks, please let me know as soon as possible so that we can fill your spot. The Kitchen is equipped with 2 ovens (one of which is convection), 2-four burner electric stove tops, 3 bay sink, reach in refrigerator and 3 large prep tables. Please note: We are not permitted to sublet anyone who emits "gas laden vapors" per the health department.